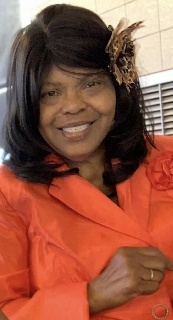 A funeral service for Katrinia Renee Anderson, age 67 of Dickson, will begin at 1 p.m. Thursday, April 11, 2019 from the chapel of Taylor Funeral Home with Dr. Jimmy Overton, eulogist. Immediately prior to the chapel service, her Eastern Star will open with a memorial service. The visitation with the family will begin at 12 noon Thursday. Friends and relatives will serve as pallbearers and floral bearers. Interment service will begin at 10 a.m. Friday, April 12th at the Middle Tennessee Veterans Cemetery on McCrory Lane. Family and friends may gather at the funeral home Friday morning to leave in procession at 9:15 a.m. for the cemetery. Mrs. Anderson died Saturday, April 6th at Tri-Star Summit in Hermitage. Born in Nashville, Katrinia was the daughter of the late Barbara Jean Nesbitt and Johnny Jones. Kartrinia attended North High School in Nashville. She retired from clerical work in the Dickson County Juvenile Court System. Previously, she had worked for several years in the Veterans Administration Hospital in Nashville. A devoted Christian, Katrinia was a member of McGavock AME Church in Charlotte. Her church work was very important to her and she spent many hours practicing and performing with “Faith Connection” and “The Gospel Lights.” She also volunteered as a broadcast host for a gospel program at WDKN Radio. Katrinia was a member of the Eastern Star Chapter and the Red Hat Society. Survivors include her husband, Richard L. Anderson, Dickson; a daughter, Shawniqua Collins, Nashville; a son, Darius Collins, Nashville; three step-daughters, Clara-Lynn Anderson, Dickson, Marilyn Spicer, Burns, and Cassandra Payne, Nashville; son-in-law, Andrew Clayton, Nashville; two sisters-in-law, Delois Fossie and Linda Robertson, both of Dickson; grandchildren, Kamare’ Hamilton, Honesti Hathaway Collins, Iyanna Clayton, and Asiah Clayton; best friend/sister, Virgie Springer; a host of step-grandchildren, nieces, nephews, and other relatives and friends. She was predeceased by her daughter, Tawanda Parker and her granddaughter, Carlwandrea Parker.